Having our Bishop present within our worship was such a great joy and honour. The Eucharistic Communion is truly complete when the Bishop is surrounded by his Presbyters, Deacons and all the Laity. The wholeness of the entire catholic Church is present in such a gathering. So, it was our greatest joy to host Metropolitan Basilios. I have asked several people to help flesh out their impressions of His Eminence’s visit. Here’s what they had to say. “I think all of us in the choir were a little apprehensive about how we would fit in with the Metropolitan's style of singing. 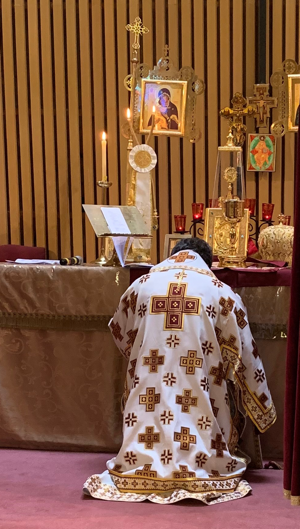 Obviously, most of the Antiochian churches use a Byzantine style and, given his Syrian origins, it's no surprise that Metropolitan Basilios does too. We on the other hand sing predominantly Slavonic music (we have only a couple of things in Byzantine style). Could the Byzantine and Slavonic styles of singing be made to work together? 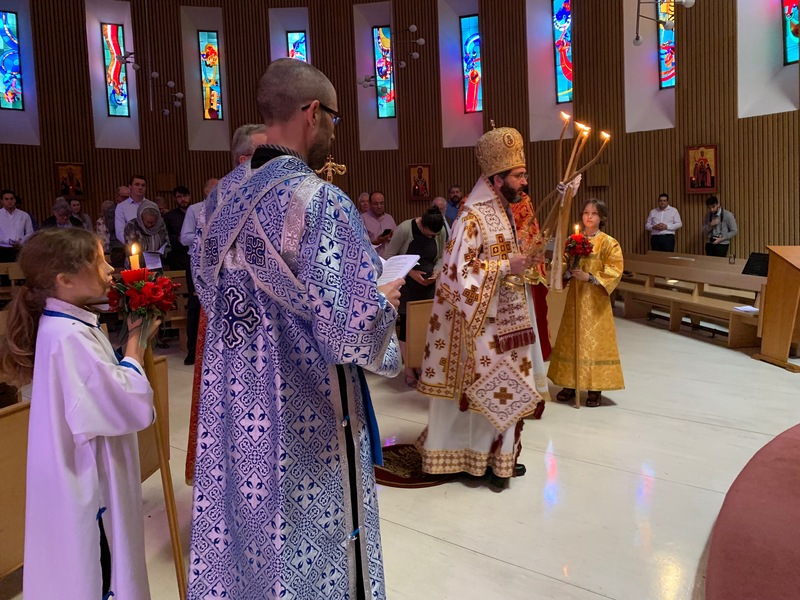 During the sermon, His Eminence spoke about the connection between the figure of The Good Shepherd and the person and role of the Bishop. 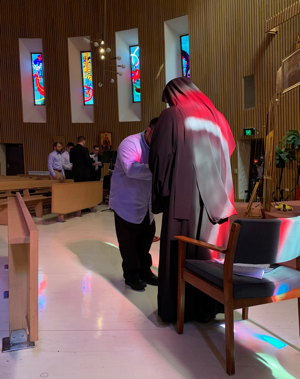 He explained that the vestment worn around his neck represents a sheep, which is a symbol that shows us his ministry is focused on carrying the sheep that is lost and needs salvation. This is a revelation to us of the One and True Shepherd in the Church, Jesus Christ Himself. We also want to send a massive, ‘Thank you’ to Mannix College. Not only did they house Metropolitan Basilios during his stay, but they also catered for our lunch. 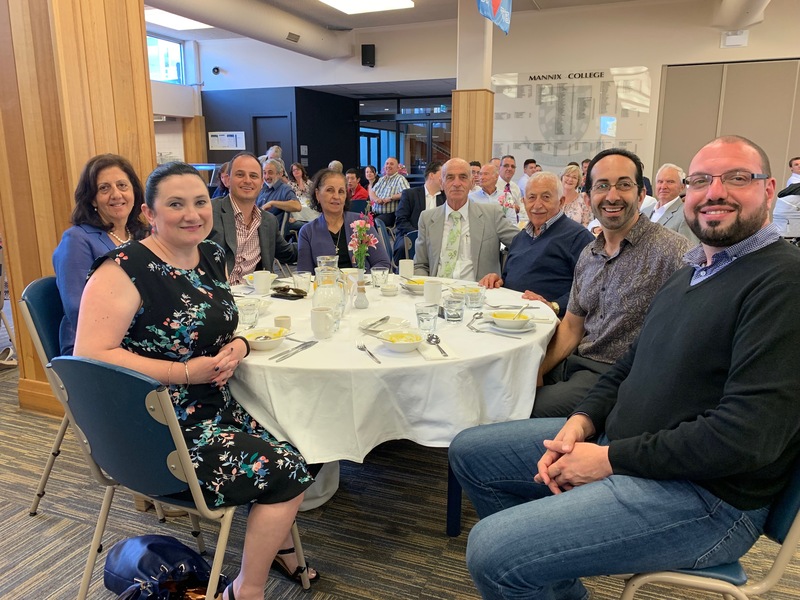 While we have on occasion used Mannix College’s Chapel when The Religious Centre was unavailable, this was the first time we have had a significant gathering at Mannix College. We thank them for their hospitality. On a personal note, it was a special joy for all the clergy to serve with His Eminence. 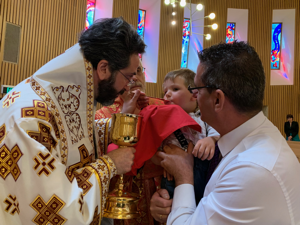 We look forward to serving many more Liturgies in the coming years and to continue making Orthodoxy accessible to more and more Australians. 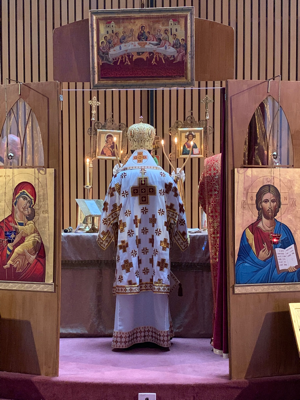 There is a real hunger for spiritual food, and an increasing need for the treasures of Orthodoxy to be made accessible to many inquirers who are seeking true spiritual nourishment. At last count, there were 22 nationalities represented at The Good Shepherd. But as I said that in my speech welcoming Metropolitan Basilios, I realised that we have long ago exceeded that number! What binds us together is a love for our Lord, Jesus Christ, and our common desire to worship together within the Orthodox Tradition. Our common language—indeed, our “heart language”—is English. 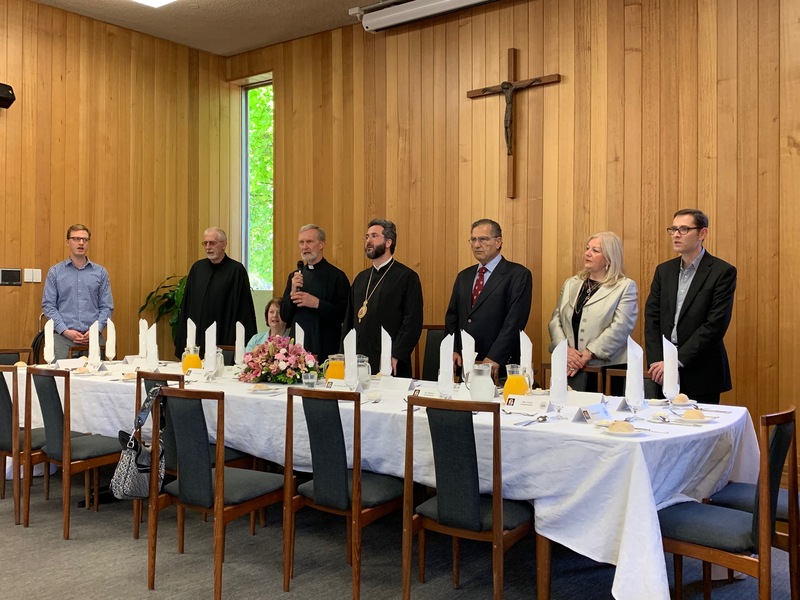 It is a great honour to be able to deliver all services of the Orthodox Church in English to our Australian members, catechumens, inquirers and visitors from a truly vast array of nationalities. Truly, the Good Shepherd has been busy gathering His sheep into the fold. It is a genuine Day of Pentecost each time we gather. We are so grateful for our Metropolitan's Blessing, support, guidance and fellowship. May there be many more days like this one in the future!